Earlier today, four ships from Japan’s Institute of Cetacean Research returned to their home port after a “scientific” expedition to the Antarctic region. The fleet claims to have captured 333 minke whales—including pregnant females—in blatant disregard of an international ruling. The 115-day expedition was the first Antarctic harvest since the International Court of Justice’s ruling in 2014 which said Japan’s Antarctic whaling program is not a scientific endeavor, as the country claims, and it must stop. 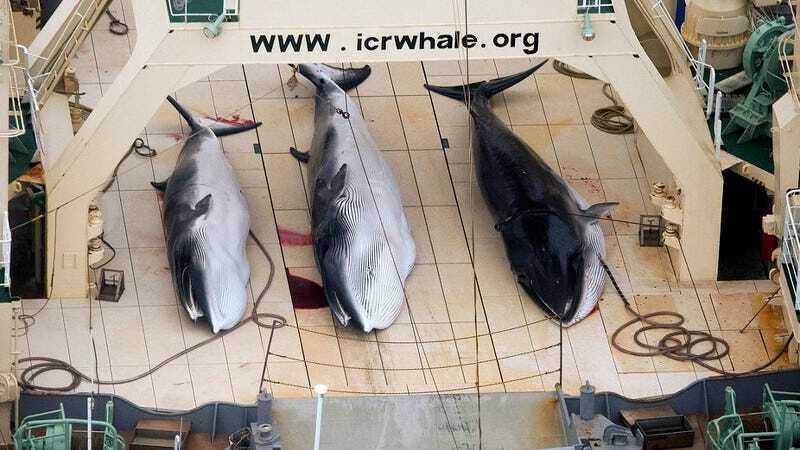 Last year, Japan conducted non-lethal research, but it now says that killing the whales is essential to its ongoing work. The 333 minke whales reaches the quota the Institute of Cetacean Research set for itself two years ago (the yield is about one-third of what it used to catch). The Institute has outlined a 12-year program that would result in the slaughter of nearly 4,000 whales. The aquatic mammals were hunted in Antarctic waters, including areas claimed by Australia, which has criticized the harvest, claiming that “lethal scientific research is not necessary.” Australia and New Zealand have threatened legal action and say they will consider dispatching patrol vessels to the Antarctic waters. In 1982, the International Whaling Commission invoked a ban on commercial whaling, but scientific research was exempted. Critics of the Antarctic hunt say Japan is using this exemption as a cloak for commercial whaling since a significant portion of the dead whales are sold.